Laloulin BoGiBo ist eine selbstgezogene noch dunkle Schimmelstute mit hervorragendem Springblut. Außerdem ist sie ein echter Eyecatcher für die Dressur durch drei super Grundgangarten. Ein athletisches Pferd, welches sowohl für den Spring- als auch den Dressursport geeignet ist. Das aktuelle Stockmass beträgt 1.62m, aber sie wird noch wachsen. Vater: Achtjährig bewies Casino Berlin erstmals in internationalen schweren Springen seine Klasse. Sein bisher größter Erfolg war der Reservesieg im Großen Preis des CSI Steinhagen. Sein Vater Caspar (Eurocommerce Berlin) zählt zu den erfolgreichsten Springhengsten der jüngeren Vergangenheit. Casino Berlin's Mutter Landora von Landor S war selbst mehrfach siegreich in Springpferdeprüfungen. Neben Casino Berlin brachte sie auch den gekörten Hengst Casirus von Casiro. Mutter: Haloubet BoGiBo ist eine Tochter des international erfolgreichen Daredevil (Jaunty Daredevil) abstammend von Galoubet A X Le Mexico. Auch die Mutterseite weist internationale Springpferde auf wie Singapore, Vancouver, Manhattan, Jasper. Abstammend von unserer Stammutter Femke (V: Jasper 'Little One') haben bereits mehrer Pferde den Sprung in den internationalen Sport geschafft z.B. Brindis BoGiBo (Punkte für den Weltpokal unter Andrew Welles) und El Berlin BoGiBo (jüngstes Pferd mit dem jüngsten Reiter Tatiana Andujar Iglesias bei den Central American and Caribbean Games 2018). Werfen Sie auch einen Blick auf unsere Homepage: www.bogibo.nl. Sie haben Interesse an diesem vielversprechenden jungen Springpferd? Dann nehmen Sie Kontakt mit uns auf: 0031-6-50653265. 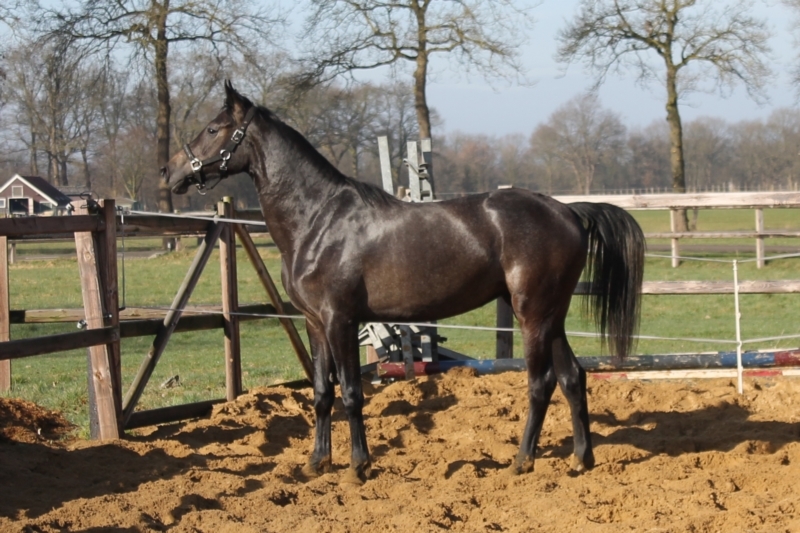 Laloulin BoGiBo is a homebred still dark grey Mare with excellent spring blood. She is also a real eye-catcher for the dressage by super gaits. 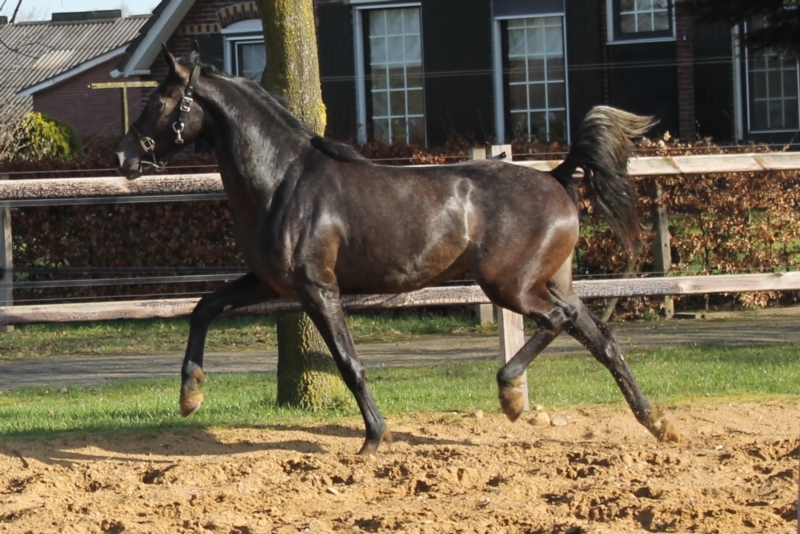 An athletic horse, which is suitable for both the show jumping and dressage. The current stock size is 1.62 m, but it will still grow. Father: Achtjährig Casino proved to Berlin for the first time in international heavy jumping his class. His biggest success was the reserve victory in the Grand Prix of the CSI Steinhagen. His father Caspar (EuroCommerce Berlin) is one of the most successful jumping stallions of the recent past. Casino Berlin's mother Landora Landor S was itself several times victorious in horses. 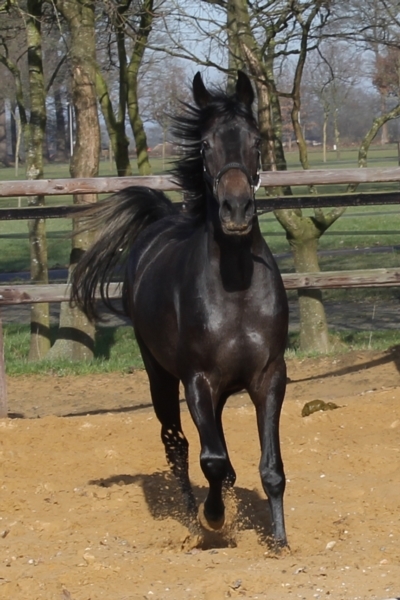 In addition to Casino Berlin brought also the approved stallion Casirus by Casiro. Mother: Haloubet BoGiBo is a subsidiary of the internationally successful daredevil (jaunty daredevil) descended by Galoubet A X Le Mexico. Also the mother page has international jumping horses such as Singapore, Vancouver, Manhattan, Jasper. Descended from our ancestress Femke (V: Jasper 'Little One') already several horses have managed the leap into the international sports E.g. Brindis BoGiBo (points for the World Cup under Andrew Welles) and El Berlin BoGiBo (youngest horse with the most recent rider Tatiana Andujar Iglesias at the Central American and Caribbean Games 2018). Take also a look at our homepage: www.bogibo.nl. Might you be interested in this promising young horses? Then contact us: 0031-6-50653265. Laloulin BoGiBo est une jument grise encore noire homebred avec du sang de printemps excellente. Elle est aussi un vrai eye-catcher pour le dressage de super allures. Un cheval athlétique, qui est adapté pour le saut d’obstacles et dressage. La taille du stock actuelle est de 1,62 m, mais il grandira encore. Père : Achtjährig Casino avéré de Berlin pour la première fois en international lourd sautant sa classe. Son plus grand succès fut la victoire de la réserve dans le Grand Prix de la CSI Steinhagen. Son père Caspar (EuroCommerce Berlin) est l’un des plus réussis étalons sauts du passé récent. Mère de casino Berlin Landora Landor S était lui-même plusieurs fois victorieuse chez les chevaux. En plus de Casino Berlin a aussi apporté l’étalon approuvé Casirus par Casiro. Mère : Haloubet BoGiBo est une filiale du succès international casse-cou (jaunty daredevil) est descendu par Galoubet A X Le Mexico. La page de la mère a également des chevaux saut d’obstacles internationaux tels que Singapour, Vancouver, Manhattan, Jasper. Descendant de notre ancêtre Femke (v : Jasper « Un peu ») déjà plusieurs chevaux ont réussi le saut dans les sports internationaux par exemple Brindis BoGiBo (points pour la Coupe du monde sous Andrew Welles) et El BoGiBo de Berlin (le plus jeune cheval lorsque le pilote plus récent Tatiana Andujar Iglesias à 2018 jeux centraméricains et des Caraïbes). Regardez aussi notre page d’accueil : www.bogibo.nl. Pourriez vous intéresser dans ce jeunes chevaux prometteurs ? Alors contactez-nous : 0031-6-50653265. Laloulin BoGiBo is een door ons zelf gefokte donkere schimmelmerrie uit uitmuntende springcracks. Tevens is zij een echte eyecatcher voor de dressuur, met drie prachtige gangen. Een atletisch paard, welke zowel voor de spring- als dressuursport uitermate geschikt is. Haar huidige schofthoogte is 1.62 m, maar groeit nog goed door. Vader: Casino Berlin springt vanaf achtjarige Grote Prijzen, waaronder tweede in de Grote Prijs van CSI Steinhagen. Casino Berlin is een zoon van Berlin (Preferent, veelvuldig winnaar, NK'06, Europees teamgoud, gouden medaille WK Aken met het team). Casino Berlin's moeder van Landor S is onder andere moeder van de goedgekeurde hengst Casirus. Moeder: Haloubet BoGiBo is een dochter van de internationaal springende Daredevil (Jaunty Daredevil) uit Galoubet A X Le Mexico. Moederskant bestaat eveneens uit internationale springtoppers, zoals Singapore, Vancouver, Manhattan, Jasper. Van onze stammoeder Femke (V: Jasper 'Little One') lopen al meerdere paarden internationaal, te weten Brindis BoGiBo (punten voor de Wereldbeker met Andrew Welles) en El Berlin BoGiBo (jongste paard en jongste ruiter Tatiana Andujar Iglesias op de Central American and Caribbean Games 2018). Zie ook onze website www.bogibo.nl. Heeft u interesse in deze veelbelovende crack? Neemt u dan contact met ons op, 06-50653265.